Synopsis: Hilarity reigns in the motion picture comedy-adventure that takes you waaay back to the beginning before Simba’s tale began…now more fabulous than ever for the first time in a 2-disc Blu-ray Combo Pack! From their uniquely hysterical perspective, Timon and his windy pal Pumbaa—the greatest unsung heroes of the savanna—reveal where they came from, how they helped Simba save the Serengeti and what really happened behind the scenes of The Lion King’s biggest events. This essential chapter of The Lion King trilogy features your favorite characters voiced by the original cast (Nathan Lane, Matthew Broderick, Ernie Sabella plus Julie Kavner and Jerry Stiller) and music by Elton John and Tim Rice. You’ll feel the love for every outrageously funny moment. This new animated bonus feature shows Timon & Pumbaa watching home movies of their animal friends at Disney’s Animal Kingdom theme park. Director Bradley Raymond and Producer George Mendoza explain why these segments did not make the final film. Hosted by Peter Graves, this mock-umentary traces Timon’s childhood. There are interviews with Timon’s mom, Uncle Max & Pumbaa, plus snapshots show him growing up. Director Bradley Raymond and Producer George Mendoza walk viewers through the film… from before the beginning. Brad and George are silhouetted against their own film with a remote, just like Timon and Pumbaa. Music video performed by Raven. Synopsis: The king of animated films reigns in this final chapter of The Lion King trilogy, now breathtakingly beautiful for the first time in a 2-Disc Blu-ray Combo Pack! Experience the power of “Upendi”—which means “love”—as Kiara, Simba’s strong-willed daughter, seeks adventure away from her father’s watchful gaze. Timon and Pumbaa can do only so much to protect her, especially when she encounters an intriguing rival, Kovu, a cub who is being groomed to lead Scar’s pride. As Kiara and Kovu search for their proper places in the great “Circle Of Life,” they discover that it may be their destiny to reunite their prides andbring peace to the Pride Lands. Featuring the original all-star voice cast, breathtaking animation and enchanting songs, Kiara and Kovu’s adventure thrills audiences of all ages as the glorious “Circle Of Life” continues for a new generation. In this new animated bonus feature, Timon & Pumbaa gaze at the night sky as the star constellations resemble their favorite meal, insects! An original animated short with vocals by The Lion King vocalist Lebo Morake. 1. Why is there lightning and thunder? 3. Why don’t Pandas live in the desert? 4. Why is there wind? 5. Why does an airplane fly? A featurette that traces the making of the movie. Performed by Kenny Lattimore and Heather Headley. 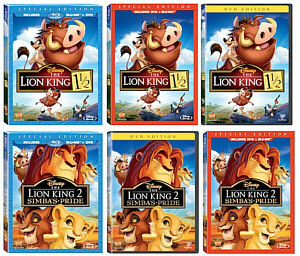 Comments for The Lion King 1.5 & The Lion King 2 on BD | DVD March 6 are now closed.